1. We are having a product on a platform. Where the users will upload the file (PDF) and share the file. 2. So now we need to provide user an interface to "Add Comments/Highlights/Marking the portions e.t.c" in a new window/tab of browser itself without downloading the file. 3. And save it back to our product. 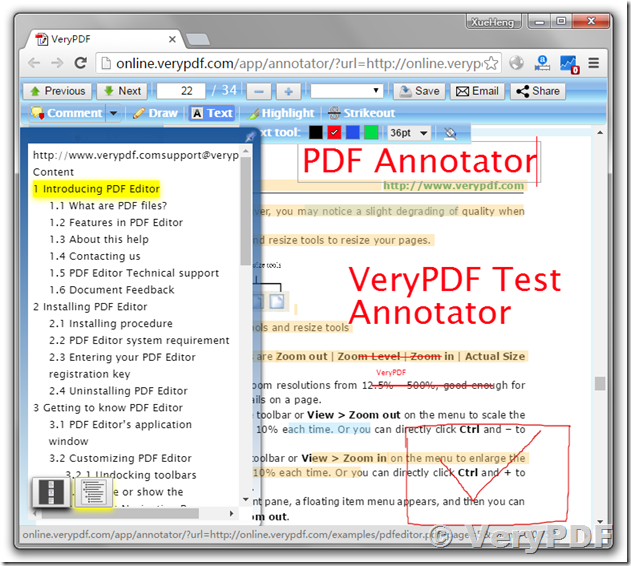 With our "HTML5 PDF Annotation" Online Application, you can implement "Add Comments/Highlights/marking the portions e.t.c" functions for PDF files easily, you can do everything on your server and without downloading the file. This entry was posted in VeryPDF Cloud API and tagged annotate PDF, comment pdf, highlight PDF, pdf annotation, pdf comment. Bookmark the permalink.